A three-member delegation from the Center for Strategic and International Studies (CSIS), a US Congress think tank on global challenges including food security, visited the IITA Abuja Station on 10 September. The team of researchers are in Nigeria to evaluate a new research project “Feed the Future and Resilience in Nigeria: Advancing Food and Nutrition Security in Fragile Environment”—a Global Food Security Project that will examine key issues relating to the implementation of the Feed the Future refreshed strategy in northern Nigeria. CSIS and IITA representatives in a group photo. Receiving the CSIS delegation, the Head of IITA Abuja Station, Gbassey Tarawali, gave an overview of IITA’s work with the United States Agency for International Development (USAID) in the past while expressing the readiness of IITA to lead other partners in implementing the USAID proposed Integrated Agricultural Program in North-East Nigeria. He equally informed the delegation of the intervention made by IITA in the North-East through the Seeds of Renaissance Program. Speaking on behalf of the CSIS delegation comprising CSIS Senior Adviser Emmy Simmons and Nigeria CSIS Representative Adedeji Olubusayo, Dr Julie Howard, CSIS Senior Adviser, explained the objective of the team’s mission to Nigeria which is to explore key resources and opportunities for the implementation of inclusive and resilient agri-food system development and nutrition security in northern Nigeria. According to Howard, the US Congress wants to outline existing US Government policies and programs that are relevant to rural and agri-food development and resilience in northern Nigeria. 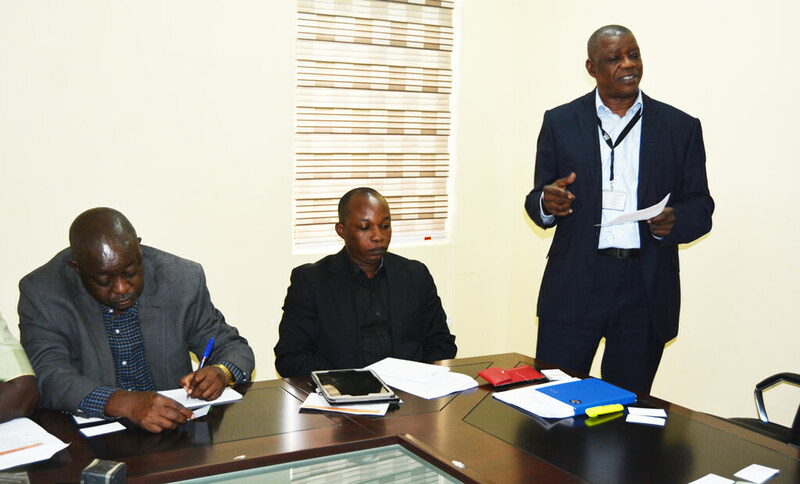 “With the vast experience and work that IITA has done, it is very important to get information from IITA. I will also use this opportunity to congratulate IITA for winning the 2018 Africa Food Prize Award,” she added. Head of IITA Abuja Station, Gbassey Tarawali, giving an overview of IITA. IITA Savanna Systems Agronomist Alpha Kamara also gave a detailed outline of IITA’s work in the North-East since 2003 and recommended that USAID consider including Gombe, Taraba, and Yobe states in their interventions as they are equally affected by the crisis in the region. Kamara also highlighted the achievements of the IITA Youth in Agribusiness program in Borno State. Responding, Simmons appreciated the work of IITA in the North-East and expressed interest in meeting some of the youth agripreneurs in Borno State. CSIS will publish the research report and develop a policy brief based on the findings in early 2019, including recommendations for Feed the Future in Nigeria and more generally for the expansion of Feed the Future in fragile environments. IITA Website by IITA is licensed under a Creative Commons Attribution-NonCommercial 4.0 International License.